Boiling it down to one sentence one can say that BoKS enables you to centraly manage user accounts and access permissions, based on Role Based Access Control (RBAC). The following article is also available as a PDF. BoKS Access Control is a product of the Swedish firm FoxT (Fox Technologies), intended for the centralized management of userauthentication and authorization (Role Based Identity Management and Access Control). The name is an abbreviation of the Swedish "Beh�righet- och KontrollSystem", which roughly translates as "Legitimicy and Control System". Centralized management of user accounts for server and desktop systems. 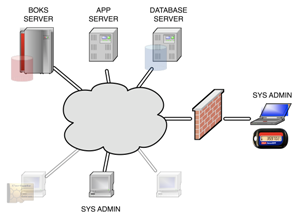 Centrally defined access rules for servers, desktops and applications. BoKS revolves around the use of roles: RBIM and RBAC. Auditing and monitoring functionality which can assist in attaining SOx compliancy. Supports most commonly encountered protocols (Telnet, SSH, FTP, RDP and so on). Supports delegated superuser (root) access. Integrates with existing LDAP or NIS+ directory services. Excellent scalability and redundancy, leading to a guaranteed uptime. Using BoKS you decide WHEN WHO gets to access WHICH servers, WHAT they can do there and HOW. BoKS is a standalone application and requires no modifications of the server or desktop operating systems. BoKS groups users accounts and computer systems based on their function within the network and the company. Each user will fit one or more role descriptions and each server will be part of different logical host groups. One could say that BoKS is a technical representation of your company's organisation where everyone has a clearly defined role and purpose. 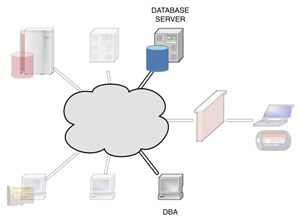 Let us discuss a very simple example, based on a BoKS server, an application server and a database server. Your database admins will obviously need access to their own work stations. Aside from that they will be allowed to use SSH to access those servers in the network that run their Oracle database. Because BoKS is capable of filtering SSH subsystems, the DBAs will get access to the command line (normal SSH login) and to SCP file transfer. All other SSH functions (like port forwarding, X11 tunneling and such) will be turned off for their accounts. Using the BoKS Oracle plugins your DBAs accounts will also be allowed to administer the actual databases running on the server. The sysadmins will be allowed full SSH access from their work stations to all of the servers in the network. Aside from their own user accounts they will also be allowed to login using the superuser account, but that will be limited to each server's console to limit the actual risk of abuse. Because the system administrators are expected to provide 24x7 support they will also be allowed to create a VPN connection to the network, through which they can also use SSH. However, this particular SSH will only work if they have authenticated themselves using an RSA token. To ensure a seperation of duties the system administrators will not be allowed access to any of the applications or databases running on the servers. The actual users of BoKS, security operations, will gain SSH access to the BoKS security server. Aside from that they will also be allowed access to the BoKS web interface, provided that they've identified themselves using their PKI smart card. No longer will you have to locally create, modify or remove user accounts on your servers. BoKS will manage everything from it's central security server(s), including SSH certificates, secondary Unix groups and personal home directories. Users will only be allowed access to your computer systems based on the rules defined in the BoKS database. These rules define permissable source and destinations systems as well as the (time of) day and the communications protocols to be used. Access rules can be assigned both to individual users as well as to roles. By defining these user classes you can create and apply a set of access rules for a whole team or department in one blow. This will save you time and will also lower the risk of human error. Every authentication request that's handled by BoKS is stored in the audit logs. At all times will you be able to see what's happened in your network. BoKS also provides the possibility of logging every keystroke performed by a superuser (root) account, allowing you greater auditing capabilities. The BoKS auditing logs are updated and replicated in real-time. This allows you to use your existing monitoring infrastructure to monitor for undesired activities. BoKS provides authentication and authorization for the following protocols: login, su, telnet, secure telnet, rlogin, XDM, PC-NFS, rsh and rexec, FTP and SSH. The SSH protocol can be further divided into ssh_sh (shell), ssh_exec (remote command execution), ssh_scp (SCP), ssh_sftp (SFTP), ssh_x11 (X11 forwarding), ssh_rfwd (remote port forwarding) and ssh_fwd (local port forwarding). Using "suexec" BoKS allows your users to run a specified set of commands using the superuser (root) account. Suexec access rules can be specified on both the command and the parameter level, allowing you great flexibility. If so desired BoKS can be integrated into your existing directory services like LDAP and NIS+. This enables you to connect to automated Human Resources processes involving your users. 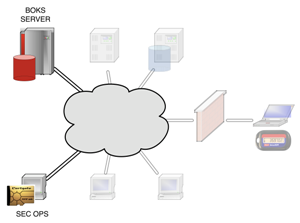 By using multiple BoKS servers per physical location you will be able to provide properly load balanced services. Your BoKS infrastructure will also remain operable despite any large disasters that may occur. Disaster recovery can be a matter of minutes. 4: Using the optional BoKS Password Manager module. You are free to use this specific work, to share and distribute it and to adapt it for your own purposes. However, you must attribute this work as mine and you must share all of your alterations. Click on the logo, or follow this link for full details. We are here at FoxT to answer any questions about BoKS - Now called FoxT Server Control. My name is Tom Russo and I am an Account Executive for FoxT in Atlanta. Please feel free to email me if you have questions or comments regarding our solutions. We are also in the process of formulating and implementing a 'User Forum' for BoKS users to share best practices etc. Please feel free to contact me anytime at 404.202.0117 if I can be of any assistance using BoKS or any other FoxT solution. Since Tom's comment sounds an awful lot like "comment spam", I've asked him to reword his message. BoKS actually came from DynaSoft from Stockholm. Back in 1998 they were bought by Security Dynamics (Now RSA and themselves part of EMC) for the smart card technology. I used to work as pre/post sales support for DynaSoft UK back in those days. Good to know BoKS is still going. I'm a fairly n00b on the BoKS system, our resident expert just went through a major upgrade to 6.5.2 and the resulting design is not as efficient as I would like it to be but then what do I know at this point. So I'm going along with the new design where we have more host groups then users and servers but that is not why I'm posting here. The real reason I'm posting here is because we are in the middle of a big deployment of RSA EnVision security event management solution and I have been told "repeatedly" by the resident BoKS expert that BoKS cannot forward it's audit logs using the standard log forwarding e.g. syslog, snmp etc. Anyone here or Cailin yourself can offer me any help or just point me in the right direction? I'm very impressed with the product and the logging it provides would be invaluable for corelating data from other security systems and give us the visibility into our systems that we currently do not have. Any assistance would be greatly appreciated! Could I please ask you to post your question in the "BoKS users group" on LinkedIn.com? I think you'll reach more people over there and I think that was your original intention. I send BoKS logs to a third party vendor event management system on an hourly basis. I am happy to consult. Currently I am responsible for many clients, in several domains all BoKS 6.5.2. Oh yeah, I'm told that BoKS stands for "Behorigkeit og Kontrol System", although my spelling might be off a bit. BoKS stand for "Beh�righet och Kontrol System" in Swedish meaning Legitimacy and Control System.